At their lowest, cycle computers start from below £20, but they can cost up to £450. At the higher end of the pricing scale, you get GPS mapping, connectivity with fitness tracking apparatus and clever performance features such as alerts to tell you how you’re performing, and what you need to do to better tailor your training. Cycle computers: how much do you need to spend? Cateye Velo Wireless Wireless Speed/ distance/ time/ calorie consumption £34.99 Basic easy to use wireless bike computer to capture accurate ride data. Garmin Edge 1000 GPS, fitness performance, detailed maps £499.00 All of above plus larger higher quality screen, multiple on and off road navigation, real time results, connect features; incoming call, email text alerts. Live tracking, social media sharing and weather. Garmin Edge 1030 GPS, detailed maps, navigation £499.99 All of above, plus rider to rider messaging, Preloaded Garmin Cycle Maps (and turn by turn navigation) Battery pack option. Mio Cycle 210 Colour touch screen GPS navigation, no performance data £199.99 GPS with speed/ distance/ time etc, with navigation wizard on board for satnav style navigation. Strava connectivity, but no heart rate or power data connectivity. Polar V650 GPS, Smart Coaching, colour touch screen, customisable profiles, Performance data £189.50 GPS, OpenStreetMap, route guidance, smart coaching feedback and power and HR data via Bluetooth. Customisable screen, with indoor, mtb and road profiles. Barometer with real time VAM and sensor compatibility and Strava live Segments. Mapping and navigation functionality usually means you will need a larger and more expensive unit, with a much more sophisticated display. And those interested in collecting other data – heart rate, pedalling cadence and power – will need connectivity to peripheral data collection devices. Cadence sensors and heart rate straps can be bought as extras or are often sold bundled with the GPS unit, though power meters are a much more expensive proposition. >>> Should you use your phone as a cycling computer? If you want to track your activity across other sports too, a wrist-mounted multisports smartwatch may suit you better and there’s always the option to use your smartphone to log activity too, though without a bar mount you won’t be able to see data on the move. Here’s our pick of the best cycle computers. With each product is a ‘Buy Now’ or ‘Best Deal’ link. If you click on this then we may receive a small amount of money from the retailer when you purchase the item. This doesn’t affect the amount you pay. The Cateye Velo Wireless computer is one of the most no-nonsense cycling computers on the market. It won’t do anything special, but pair it with the supplied speed sensor and it will cover off the basics like distance covered and average speed, and even give an estimate of your calorie consumption. One of the bug draws to a cycling computer like this is its simplicity and ease of use. Similar to the Cateye Strada wireless above it is operated by just one button on the front and the screen is easy to read. Lezyne might be best known for its pumps and multi-tools, but the America company is now looking to become a big player in the GPS market with its three device range. Much like the Garmin Edge 20/25, the Lezyne Mini GPS is absolutely tiny. It’s not quite as advanced as the Garmin Edge 25 as it doesn’t feature ANT+ or Bluetooth connectivity, which means you can’t measure heart rate or cadence. However, it is capable of measuring the basics, including distance, speed, time, average speed, temperature and time of day. One area that the Lezyne Mini GPS does excel in is its customisability, and you can change the screen to show up to four data fields. The Garmin Edge 25 is one up from the bottom of Garmin’s GPS range, but it is probably the best basic option for new riders as it will connect with a heart rate monitor, meaning you can do more serious training further down the line if you want. It’s primary selling point is that it’s incredibly small (in fact, at time of writing it’s the smallest GPS computer in the world) and astonishingly easy to use even if you’ve never used a Garmin before. Impressively, it can connect to both standard GPS and the more accurate GLONASS satellite. It also has a no nonsense approach to data screens and simple buttons to navigate between them. Amazingly, despite its size, it doesn’t skimp on connectivity and it features both ANT+ and Bluetooth. The Edge 130 is one of Garmin’s newest releases, and it proved to be stripped back compared to Garmin’s latest releases, yet a very capable cycling computer. Using buttons instead of a touchscreen, Garmin has managed to do away with the buggy software that plagued the Garmin Edge 820 and even the Garmin Edge 1030. Because of this, it’s also much easier to set up, and changing data fields is a breeze to do, and is even possible on the fly. 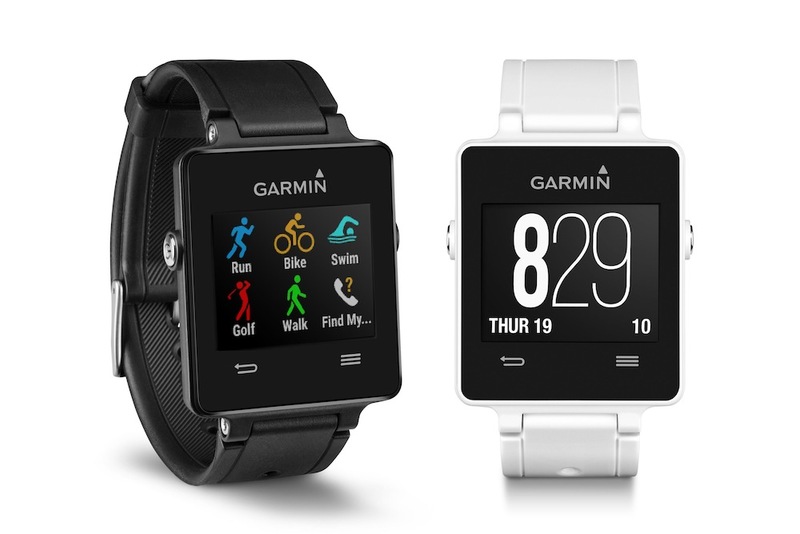 It’s a touch bigger than Garmin’s smallest offerings but it can also do much more. It can pair with ANT+ and Bluetooth accessories such as heart rate monitors, cadence sensors and power meters. The small device weighs a meagre 33g and sits very neatly out the front of a bike. Its crisp screen is very easy to read, too. It is a device that would suit those who want to push their performance, chase Strava Live segments and train but don’t need the top-end features offered at greater prices. Wahoo has definitely gained ground on Garmin over the last couple of years, and we rate their devices very highly, largely for their ease of setup and great software. The Elemnt Bolt’s USP is its aerodynamic body, which claims to be 50% more slippery than others on the market. The data screens are all set up via a Smartphone, so you can’t be without one if you plan to invest in this unit. Happily, the app is very good and we found it to be really user friendly – though the readability of the mapping left a little to be desired. The Lezyne Super GPS is standout because of its astonishing value for money. For a fraction of the cost of a Garmin you get all the same connectivity and training features. The savings are made in the design, but the Lezyne Super GPS is perfectly functional and the black and white screen and buttons just serve to boost battery life. It’s not as slick as Wahoo’s but the Lezyne device can also be set up via its companion app. We’d recommend getting an out front mount for it as the standard one makes it sit very high on the stem. Getting started with the Mio Cyclo 210 is very easy: turn it on and you have just six menu options, displayed via large coloured buttons. Hit Dashboard and you’re ready to roll, with two screens of stats and a map screen. You can configure the screens displayed too, selecting the number of screens, number of fields on each and the data displayed. The Mio Cyclo 210 includes a Navigate function. You can map out routes easily on a computer with Mio’s mapping software. It’s detailed, accurate and easy to use and includes many footpaths and bridleways as well as roads. What you don’t get on the Mio Cyclo 210 is any connectivity to peripheral devices. So if you want to know your heart rate or your power output, look elsewhere, although the MioShare app lets you manage your stats on a computer and automatically upload your data to Strava. The Polar V650 GPS Bike Computer packs a lot of features in for it’s £189.50 price tag. 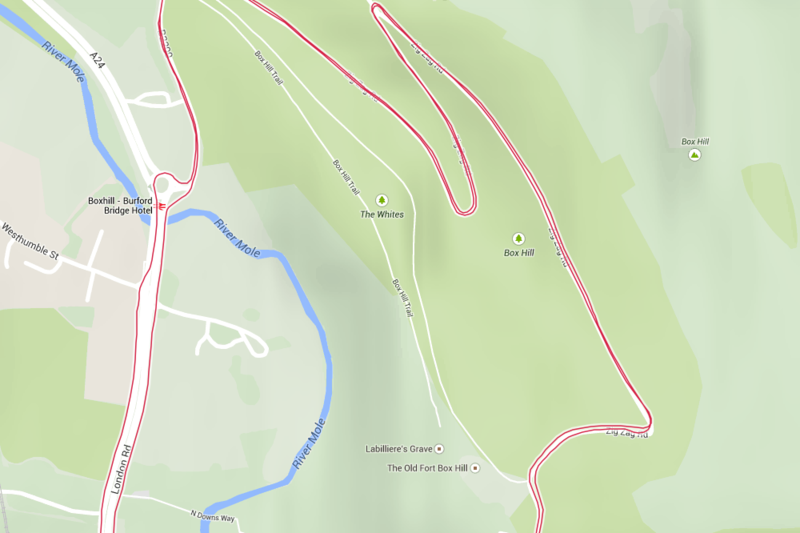 GPS navigation uses OpenStreetMap and allows for routes to be uploaded, with guidance. Smart coaching provides feedback immediately after rides, and also calculates training load and rest requirements. The Garmin Edge 520 really kickstarts Garmin’s bonafide training devices. It’s capable of measuring your Vo2 Max, conducting FTP training and much more. It’ll also assess your riding and give you recovery times based on your efforts. It works alongside Strava segments, too – so you can get live updates as you attack that hotly contested KOM/QOM too. You can also upload routes from Strava or Garmin Connect, although it can’t create routes on the device itself – that was update saved for the Garmin Edge 520 Plus. In many ways, it’s similar to the Garmin Edge 820, although it’s better because it doesn’t have the buggy touchscreen. The Wahoo Elemnt is the older sibling of the Elemnt Bolt and still a fantastic computer, although it doesn’t look as modern as some new devices. It still relies on the use of the Wahoo companion app, but that makes the setup very easy as it’s all done on the smartphone. It can pair with all ANT+ and Bluetooth devices, and Wahoo has a series of pre-planned sessions loaded on the computer should you want to use it to train with., although it’s not as advanced as the performance features Garmin can offer. The Garmin Edge 1000 is aimed at competing, connected and navigating, and by it’s own admission, allows you to turn every ride in to a race. The unit comes with in-ride challenges and connected features, with preloaded free Garmin Cycle Map, including Open Street Map, with sat nav style turn by turn navigation, and address search that isn’t dependent on mobile phone network coverage. Compatible with ANT+ sensors, including Shimano Di2 digital shifting systems, and all ANT+ power meters. When paired with your smartphone and the Garmin Connect Mobile app, Edge 1000 offers a suite of connected features, including live tracking, incoming call and text alerts, social media sharing, weather, wireless uploads and the sending/receiving of courses and segments. As soon as your ride is complete, the data can be automatically sent to Garmin Connect via Bluetooth or Wi-Fi. You can’t help but raise your eyebrows at the price of the Garmin Edge 1030, but the spend certainly gets you the most ‘all singing, all dancing’ cycle computer currently on the market. You name it and the Edge 1030 can do it, offering everything from comprehensive mapping, to data analysis, all the way through to the ability to see communicate with electronic groupsets and even other Garmin Edge 1030 devices. Performance-wise, it is capable of doing all the things that the Edge 520 can do plus it offers enhanced analysis when you use a power meter with it. While it does perform better than the Edge 820, it’s a shame to see the touchscreen (and some of the related software bugs) be carried over to the 1030. Ultimately, it’s probably suited best to those who race, and the rest of us are better served with a Wahoo or the Garmin Edge 130. The most basic cycle computers are generally available from about £15 (or even cheaper if you do a bit of shopping around). Of course, for this sort of money your cycle computer isn’t going to be packed full of functionality. 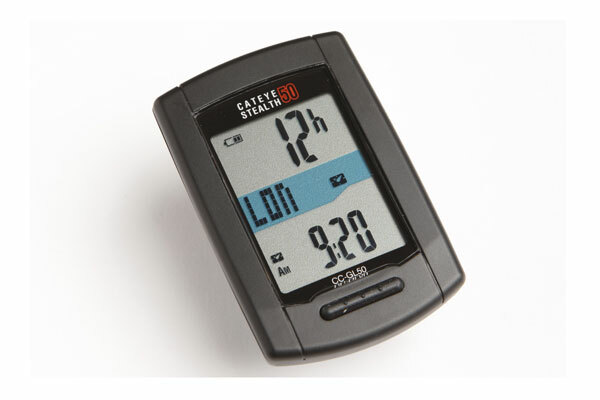 The very cheapest cycle computers will measure the basics such as your speed and cadence (and from these calculate things like your averages speed and average cadence), taking these figures from speed and cadence sensors located on the bike frame, to which they are connected using wires. Pay a little bit more (from about £30) and you can upgrade to a wireless cycle computer, which will connect to your speed and cadence sensors without the need for having unsightly wires running all over your frame. These sorts of computers are probably the best option if you’re on a budget and aren’t worried about uploading your rides to Strava or doing any serious, structured training. Between £50-£100 there are a lot of different cycle computers that begin to offer a bit more functionality, but still can’t quite go as far as being a true cycling GPS unit. In general you’ve got two different types of cycle computer that sit in this price range. First off you’ve got units that are similar to cheaper models, but offer a little more functionality, such as the ability to connect with a heart rate strap using Bluetooth or another wireless protocol, which will allow you to do more serious training and to calculate the calories that you’ve burned. The other option is a so-called “smart” cycle computer. These computers not only connect with bike sensors using Bluetooth, but can also connect with your smartphone to use your phone’s GPS function. This means that you can use them as GPS computers, tracking your ride to upload it to Strava when you get home. Just make sure your phone is fully charged when you leave the house. An entry-level GPS unit will typically be priced just over £100, although if it is bundled with a heart rate monitor and/or cadence sensor the price will be higher. At this price point, manufacturers prioritise ease of use, small size and low weight – usually well below 100g. The GPS unit will typically track your ride statistics such as distance, time, speed and lap times but will not provide navigation. Most units will pause automatically when you stop moving and resume when you restart and provide ANT+ peripheral connectivity. Ride data is typically displayed in two or three rows of monochrome text. There may be the option to specify which data items and how many rows are displayed, but one of the selling points of these devices is that you turn them on and start cycling without needing to delve into complex configuration options, so personalisation tends not to be a priority. The GPS may also allow you to set alerts when you have reached a target value such as having ridden for a pre-specified time. You may get virtual competitor functions, so that you can see how well you are doing compared to previous rides of the same route. Spend a bit more and you will start to get additional functionality in your GPS. Mid-level units typically come in around the £200 range and above – again increased if bundled with a heart rate monitor or cadence sensor. A mid-range unit will usually be larger with a larger screen which can display more data, often in colour. Data storage capacity will probably also increase. The unit may be controlled by buttons or a touchscreen. Many mid-range units add mapping and navigation functionality. You can buy GPSs which major on this functionality, although others still just support breadcrumb trails. Because of the way in which GPS satellite triangulation works, altitude data calculated from GPS is less accurate than positional data. Thus higher spec GPSs will often add a barometric altimeter to increase recording accuracy for height and rate of ascent. Many mid-range units now include Bluetooth synchronisation to a smartphone. This allows alerts to be displayed on the GPS when an incoming call, text or e-mail is received. Other data from the phone, such as weather conditions, may also be displayed on the GPS. Some cycle computers send data back to the phone, so it can transmit ride progress data to the internet, where people you allow can view it, and let you upload your rides without needing to connect to a computer. The arms race in high-end cycle computers continues and manufacturers seem to be announcing new top of the range features every few months. These halo products come in at £400 or more and weigh around 100 – 120 grams. Most will come packaged with a heart rate monitor strap and a cadence sensor. At this price point, you should expect a colour touchscreen, mapping, turn-by-turn navigation and many connectivity features. This may include WiFi connectivity for data transfer, route suggestions and ability to share a route with your ride companions. Some are adding Strava-like segment functionality. There’s often a microSD slot to allow you to store data on your GPS beyond that which can be held by the internal storage. Expect more integration with other devices and applications in future such as Shimano’s Di2 to allow control of the unit without taking your hands off the bars and Strava to give you segment information. With their large displays and rich functionality, battery life can be an issue with some top-end units. Once the EU’s Galileo GPS satellites are commissioned, it is likely that devices will become available which use this GPS system too, potentially putting further strain on the battery. 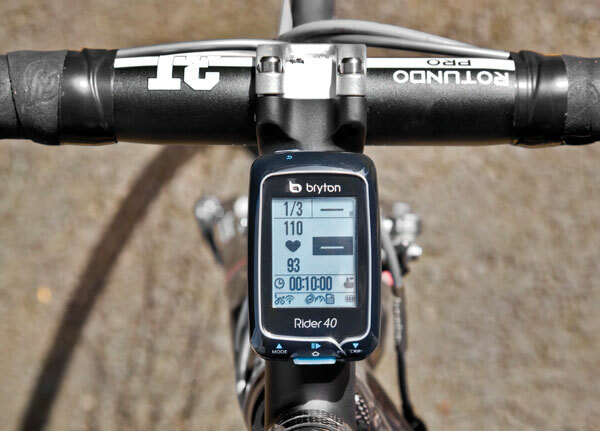 Even basic cycling GPS units allow you to download data post-ride to the manufacturer’s ride recording site. These sites support ride analysis, training plans and social interaction, as well as upload to Strava, Training Peaks or other third party sites. Manufacturers’ sites vary in sophistication and user friendliness. Analysis options will be richer, of course, if you have used peripheral devices such as a cadence sensor to capture extra data. If you don’t want to buy a cycling-specific GPS, other options are available. Modern smartphones will have a GPS chip built into them. This may not be as accurate as the chip in a dedicated cycling GPS but should still allow you to track your position with reasonable accuracy. You can download free activity tracking apps from the Apple Store or Google Play to log your rides. There are many of these such as MapMyRide and Endomondo, although the most popular of the lot is Strava. You can either put your phone in a pocket or buy a mount which attaches to your bars or stem. These normally have a clear plastic zip up sleeve on top, so that you can see your data as you ride. If you use your phone beware of water, as most are not water-resistant. Battery life may be an issue too, especially if you want to use your phone’s display to see your data while you ride. If you are going to carry your phone, another option is to use its GPS capability to collect ride data, which is transmitted via Bluetooth to a bar-mounted display unit. This allows you to keep your phone out of the way and turn off the screen whilst still being able to see ride statistics. Display units will usually also show data collected from peripheral devices via ANT or Bluetooth. For those triathletes among you, a GPS enabled sports watch may be a better option. These allow you to track activity across different sports and may allow ANT+ connection to peripheral devices too. Most come with a bar mount, so that you can use the watch attached to the bike or on your wrist. With a price tag north of £400 you should expect a lot from the Garmin Epix watch, and that’s what it delivers, offering all the conceivable data that any multi-sport athlete could ever want. It’s easy to be overwhelmed by the sheer level of functionality on offer, but once you get the hang of it, the touchscreen is easy to use and the amount of data at your disposal should help to make you a better athlete. The Polar V800 is more than just a sports watch, it is also designed to double as an activity tracker, meaning that it send you reminders when you’ve been sat behind your desk for too long. It’s also great for really serious athletes training day after day as it will track your recovery to help you know when it’s time for a day off. However much you want to spend and however much data you decide to record, a GPS unit will enhance your ride by leaving you a permanent record of where you have ridden, when and how fast. It will give you the option to delve further into your performance and the tools to improve and broaden your cycling experience. You will be able to share ride data with friends, compete against others and improve on your personal bests.